In 1928, Dr. Joe Adamson graduated from Marquette University School of Dentistry and started his dental practice above the recently completed Roosevelt Theater on Roosevelt road and 29th avenue. As America was struggling to recover from the Great Depression, and before banking regulations were what they are today, someone decided to build a house across the street from Dr. Adamson’s office. The individual finished the outside structure of the home, but ran out of money before completing the inside. Dr. Joe was able to work out a plan with the individual and the bank to take over payments and covert the home plan into a dental office. Dr. Joe’s son, Dr. Richard Adamson, graduated from Dental school in the late 60s. After a short military stint, he joined his father in practice. 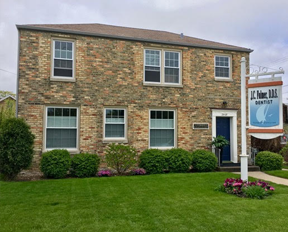 Dr. Jim Fulmer, cousin of Dr. Richard Adamson, purchased the Kenosha practice from him in 1998 and continued to operate out of the same building. Dr. Fulmer’s daughter, Dr. Kaleigh Fulmer, graduated from Marquette University School of Dentistry in 2017 and joined her father’s dental practice soon after. Our family has been providing Kenosha and the surrounding community with general dentistry and emergency dental care for nearly a century. With our continued passion for dentistry, and interior upgrades in our Kenosha office, we are committed to serving the residents for many years to come.